What the...?! I don't remember you releasing a demo with all the new graphics and CBS actually playable! =O The copy I have must be old, old! XD Ugh makes me feel like geezer. 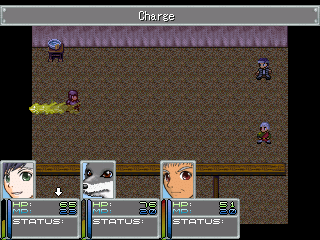 Experimenting with new battle sprites and playing around with the DBS. Digging the custom sprite sized battler and goblin-like critter! Really goes well with with the FF6 Phatom Forest background. Very cool AFL! No, no, no fish! haha, You likely have the last release of the game. I never released anything with the CBS. I wasn't even working on a CBS back then. The glitch at the end is a huge mess and stops gameplay right near the end of the demo. Something to do with one of the custom menus. I also wasn't the neatest, notekeeping-est scripter back then either, so I don't know if patching it would be easy even for me. I like the style of the sprite. The pose could be a bit more dynamic, looks more like he is standing around look at the sword than actually being in a battle. Yeah, I was having some difficulty getting the legs to look how I wanted, but I completely agree with you there. EDIT: I'm think about reducing the shading from direct rips of SOM to something sorta close to this - its a little brighter than I want, but its a rough idea. The characters don't use much detail so it felt weird that their surroundings did. The trees still look pretty awful and I am yet to mess with the actual water itself. Eh? I like it AFL. Bright colors aren't my personal favorite, but it still looks good. Reducing the detail in the tilesets will be a good idea. Did you edit the rocks? I especially like the way those came out. I started working on animations for character's unique skills. I also started a post about the project on rmn and tumblr. Yeah, I'm going to just try to darken everything as a general rule - I just didn't want to do anything until I decided whether I liked it or not. The rocks are pretty minimally changed, but it worked well. I really really like how that looks. I'll have to check out your topics for it. The grass was changed, the problem there is I don't want to it to be too blank. Maybe I just should get rid of the darker grass? The water is on the list. Love the glowing fade Timber's got going on there! One of my favorite tricks to do with battle animations. How do make such pretty things using so few of colors? :O It's like old school game boy in high def. Thank you, I find it easier working on smaller stuff with a limited number of colors than the other way around actually. And it's a game boy game so nothing really high def about it. Do you make all the sprites beforehand or do you just hex it up? Your welcome and to me it looks kind of detailed on the skull. Lots of shadow. Hex as in a spell? o.O I thought you were only a pretend wizard! I'm also kind of curious about that, though. It's not like you can 'import' graphics into a rom... or can you?